China has over fifty minorities co-inhabiting in the country’s territory. Some of them are small others are large and dominant and, despite sharing a some cultural elements, they are very distinct. 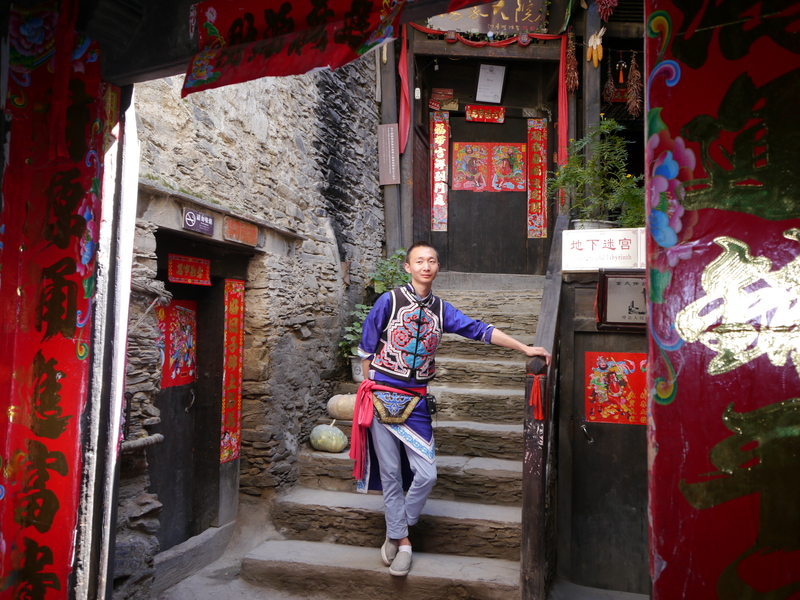 On a trip to Chengdu, the Six Senses Customer Services Manager suggested we go on a tour of the Qiang Minority village. Chengdu, in Sichuan Province, is considered China’s most fertile area and well-known for being the heart of panda breeding efforts. Flanked by the Tibetan Plateau on the West, the area is filled with mountains, valleys and rivers. Not knowing much beyond the pandas, we took his recommendation. 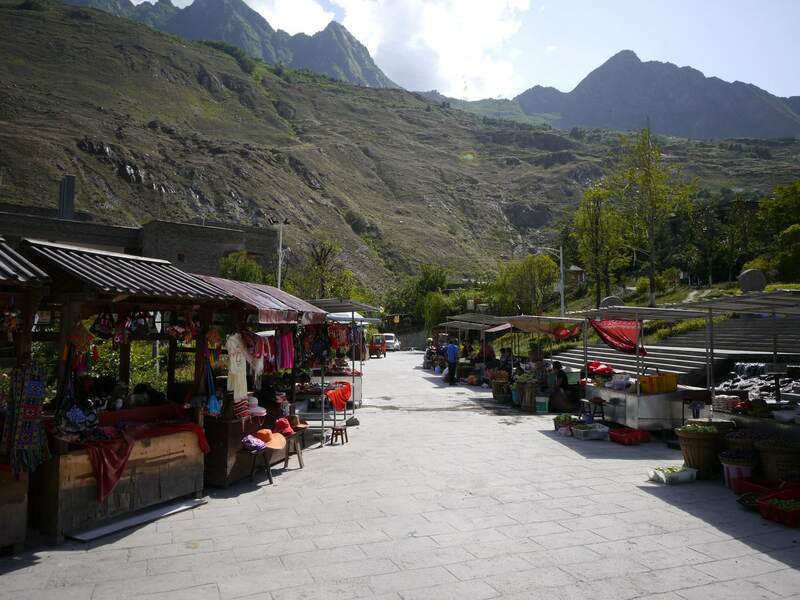 The Qiang Village was a two and a half hour drive from the resort, at the bottom of the Qing Cheng Mountain. Our guide, Carol, was excited about the sunny day. “We only have ninety days of sun a year in Chengdu!”, she exclaimed in absolutely cheer. I was as excited as her, for the blue skies would make for a wonderful, if steaming, day out. On the way to the village we passed steep mountain passes, drove along flowing rivers and crossed through mountain tunnels expertly built. There were countless deep, and often dark, tunnels that seemed to take us farther and farther away from civilization. As I dozed off, we climbed higheruntil just below the 3,000m mark, when we arrived at Taoping Village. 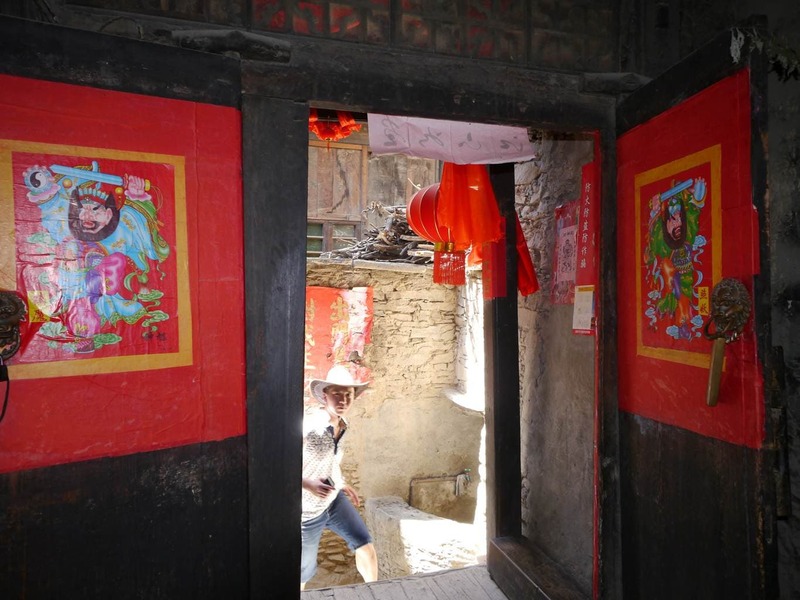 Submitted for approval to be included as part of the UNESCO World Heritage list, the original village was just 17km from the fault that caused thousands of deaths in Sichuan’s 2008 Earthquake. Despite its close location to the epicenter, the village suffered little to no damage and there were no human casualties, The buildings and houses stand tall until today. It is this resilience and the intelligence that went into building such incredible defensive structures that was most fascinating. As we walked into the new tourist village built on the outskirts of the historical area I was slightly weary of the touristy image of the place. Street vendors were parading their wares. Shiny tableware, Tibetan inspired cheap clothes, trinkets and a variety of goods for sale. It all looked like a tourist trap more than like a place of historical value deserving of UNESCO status. The reality of the village only sank in after a fatty, heavy and very oily lunch under the shade. Carol took us through the maze of streets in the tourist village to find a suitable spot for lunch. We sat down in front of a restaurant and guesthouse, under the hot summer heat. Although we were in the shade, I could not stop sweating. The food did not help. 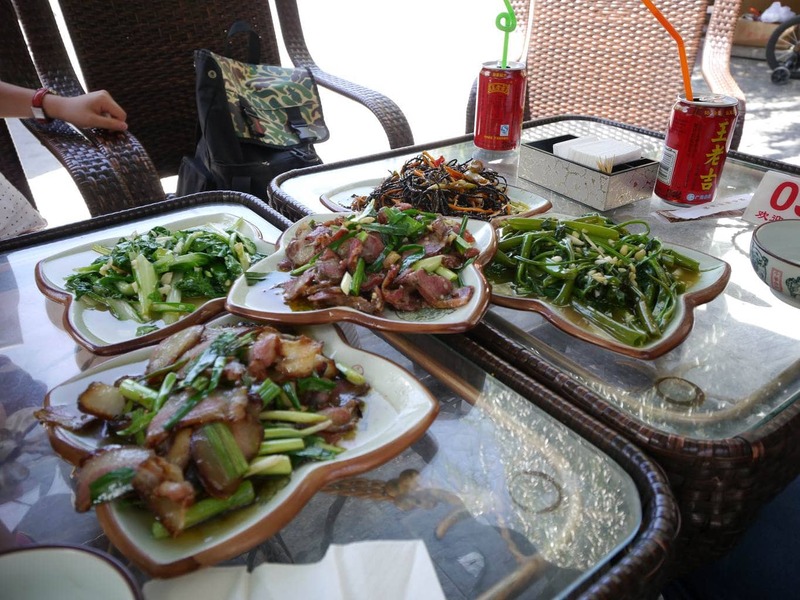 She selected a few Sichuan specialties, which we appreciated, but they turned out to be of the greasiest type. The pork strips were swimming in a bowl of oil and the stir-fried water spinach was drenched in a pool of sauce and garlic. It was tasty, but hardly an easy to digest or light lunch. After a few glasses of cold, canned, sweet tea we walked towards the entrance of the village. We agreed to take a local guide for the grand total price of $10 for a two hour tour. Possibly the best investment I have ever made. I was still skeptical about the visit. Was this just going to be one of those tourist-trap tours where someone dressed in traditional clothes takes you around to watch “how the locals live” in a widely artificial village? Taoping was built as a defensive villas over 2,000 years ago. After several invasions and fight with neighboring villages, the Qiang Minority developed incredible defensive skills and structures. We walked along the cobblestoned passages, tunnels and basement corridors almost always in the shade following our local guide, who spoke in Mandarin to Carol, who in turn translated for us. Qiang people do not have a written script but speak a language of the Tibetan-Myanmese language family but they adopted written Mandarin. Our guide was dressed in traditional clothes. Wearing a purple and red embroidered silk tunic over his trousers and a hat, he was skinny and agile, jumping around the various door frames, up and down steep and narrow staircases I needed both hands to climb. He was kind and patient, slowly explaining every aspect of their lives and their customs to us. It was incredibly insightful and fascinating, like stepping back into the times of fabled Chinese legends. It is believed that there are just over 300,000 Qiang ethnic people in China mostly living in the Tibetan Plateau. 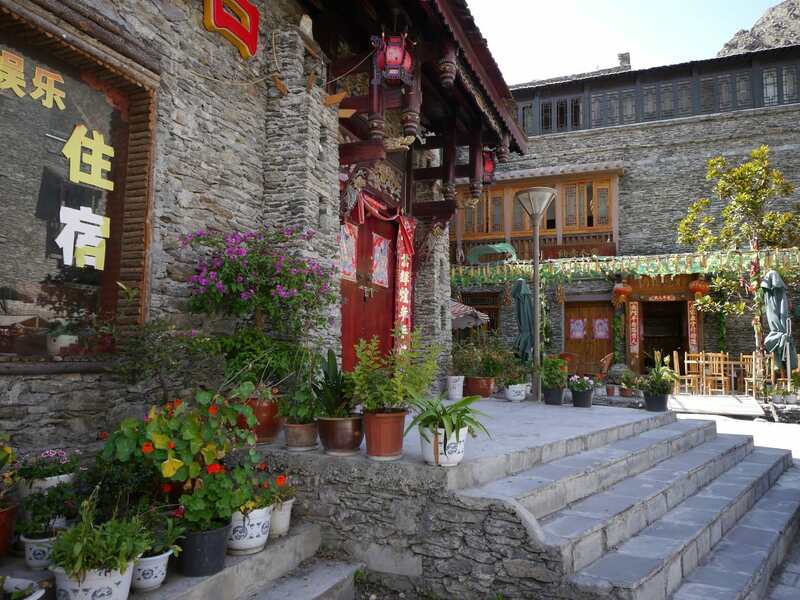 Taoping is just one of few villages and ones of the best known ones and most easily accessible. Originally, Qiang was not an ethnic minority but the name the Han Chinese people called anyone living in the Western part of the territory. 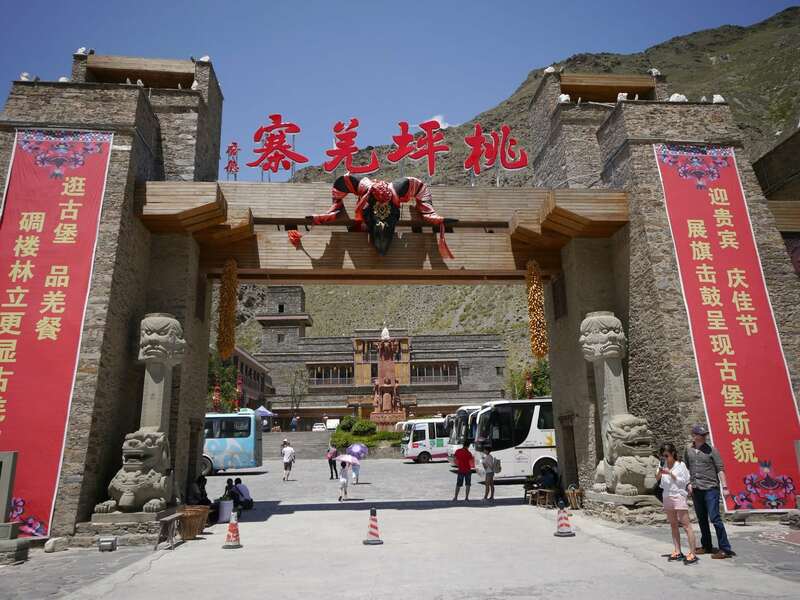 As some of them were assimilated by the Han and the Tibetan clans during the 7th to 10th Century, the remaining minority evolved separately into today’s Qiang group. Until China’s national liberation, in the mid-20th Century, the Qiang subsisted in a primitive society marked by slash and burn agriculture and a feudal system. Qiang villages are made of very tall and narrow buildings made of piled stones of all sizes. The buildings may have some balconies and rooftops, which we climbed on to have the best views, and are made of at least three floors. The first floor is for livestock and poultry, the second for the bedrooms and the third for grain storage. The visit was interesting and took us through walkways and hidden corridors within and outside the houses. He showed us how house doors were open, without keys, and how attackers were fended off without any weapons. Various traps ensured the enemy was slowed down for the families to escape. There were hiding places and water canals designed to ensure continuous supply to the village in case of siege. The various structures and contraptions were ingenious as much as they were simple. Pieces of wood were used to lock doors, the air and the natural elements relied upon to preserve entire pigs for the winter months. Sausages and smoked bacon were kept in the top floors after slow smoking in the kitchen thanks to the cooking fumes. Life looked simple and yet completely well thought out. There were some placards and signs indicating the names of the families in living in each building or the background and use of certain unusual items. 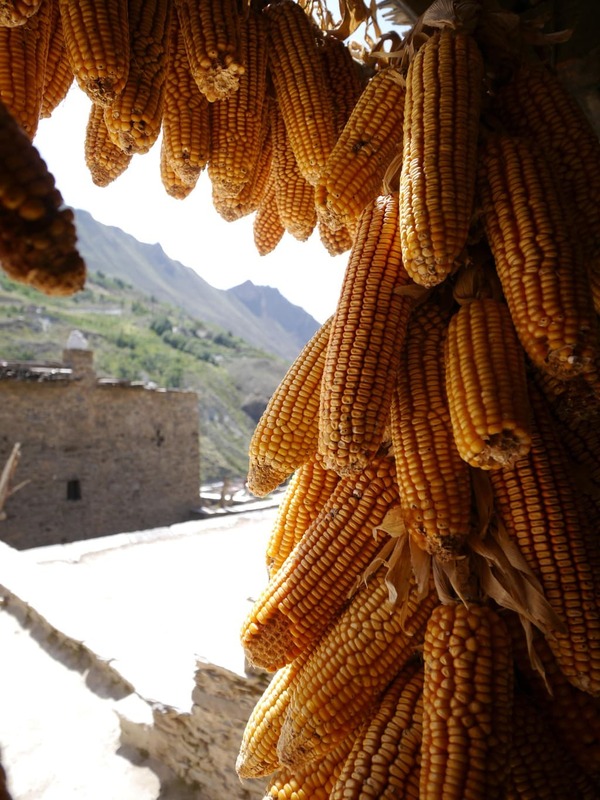 The houses were filled with hanging chilis and corn, one of the staples from the area, eaten instead of rice. The grey color of the stones was interrupted by the bright red and golden colors of the posters, some of which were meant to keep ghosts outside. Red lanterns hanging from the ceiling added more color. The scenes were like a black and white photo that had been treated to show only some items in color. As we were walking out of one of the houses our guide instructed us to go through the middle door. Each of them was intended for a different type of visitor. Neighbors had their own entrance. Our left food was to come first. At the end of the visit, we asked Carol if we could tip and she suggested $2. Considering the incredible explanations and his kindness and patience as Carol translated everything to us, we gave him $10. “Thank you”, he returned. “You speak English?”, I inquired, surprised. “Yes, a little bit”. It turned out his English was as good if not better than Carol’s. The Qiang Village has been set as a means for the ethnic minority to get an additional source of income. Located so far from civilization, up in the mountains with steep and rocky hills, their subsistence continues to be primitive. Ironically, since the 2008 Sichuan Earthquake, when the new touristy village was partially destroyed, the Taoping became an even more interesting destination, its survival proof of its historical and cultural value. On our way out, we walked through the maze-like streets again, passed the bored street sellers, and onto the main entrance to the village again. A few local women touted our guide to buy fresh local plums or sunflowers, their flowers packed with fresh seeds. She bought an entire bag and the sweet and juicy yellow fruit dripped through my fingers as I bit into the thin skin to devour the flesh. Summer at its best, in this rocky and isolated part of the world.